If you're still looking for gifts for the tea lover in your life, I've put together a few ideas to help you through the holiday gift-giving conundrum. For friends interested in learning more about tea, a tasting is always helpful. How about a gift of tea sent to their door each month? One of my favorite vendors Joseph Wesley Tea has a Year Of Tea which would be perfect for any tea lover. Joe's teas are top quality and carefully sourced. If you know someone looking for a unique tea experience, the White2Tea club is also a great monthly choice. There is a huge variety of surprising teas, and their packaging can't be beat. Tea books are always a good idea. There are many I've recommended in the past, and this year Tea: A User's Guide tops the list. It's insanely informative and a great reference guide. A must for all tea lovers. There are dozens of tea books out there, one for every type of tea lover. How about a special teapot? If you are able to find one from Petr Novak, grab it for your favorite tea lover. His pots are are cult favorite. Another one of my favorite artisans, The Jade Leaf just put a few new stunning pots up for sale. Get them while you can! They always sell out quickly. Lower priced options like nice glass teapots and gaiwans are always useful, and much easier to find. With just a little bit of research you can find one for every budget. I love using glass since you can enjoy the color of the liquor and watch the leaves unfurl. Even the most seasoned tea lover would appreciate a new glass teapot. Decorative sugars are a lovely way to dress up a tea session. They also make great holiday or hostess gifts. My favorites are from Chambre de Sucre. They come in all sorts of fun shapes, colors, and styles. Fun for tea parties or an afternoon treat. They brighten up any holiday! For something a little different, what about a tea pet? Tea pets can be found on many tea vendors sites, many are made of yixing or similar clay. They come in a variety of animals and objects and range from the adorable to the bizarre. There is definitely a tea pet to suit every person. This is a fun gift for the tea loving friend that has everything. I love these handmade tea pets from my friend Jo Johnson. They are beautiful and special. Jo also makes stunning jewelry, in fact her tea leaf jewelry is on the top of my own wish list. If there are other gift ideas you're thinking about, feel free to ask questions. I'd love to help you out to make the gift giving process a little bit easier! 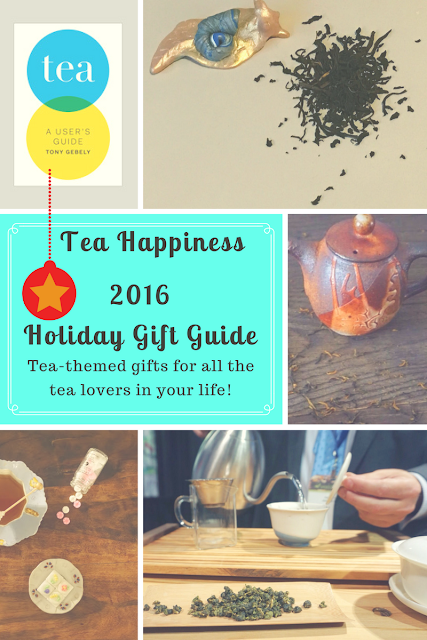 Of course, you can't go wrong with just about any tea-themed gift. Enjoy the holidays! I recognize some of these gifters!